Kuala Lumpur, 10 Dec: Even those disillusioned with Mahathir are divided over the unprecedented nose-thumbing by the Palace on the Old Man. The satire master Husin Lempoyang rubs it in with Kesian, dia teringin (Poor thing, he's hard up) contending that it is the host's right to invite someone or not. On the other hand, Bujai tries to be circumspect. In We will look stupid, the veteran journalist, who is now one of Zahid Hamidi's thinkers, is honest - too honest, perhaps - with his admission that "...I don't really know whose decision was it to stop the duo from attending the new Yang Dipertuan Agong's investiture next week". Most people don't have an idea, either, but pretended to know and proceeded to hold either Najib Razak or the Palace responsible for this development. Mahathir, grinning I'm sure from ear to ear at the opportunity that has presented itself to him, blames Najib, the ruling BN government, and the Palace. In Pembatalan, his latest blog entry, the former PM and BN chief gayly accused the Rulers of being subservient to Najib and his BN party. Is Mahathir sad, you think? Don't count on it. What would he gain by attending the Investiture? Nothing. What can he gain now that they have prevented him from attending the Investiture? Everything! Well, at least that is what the Tun would aim for. 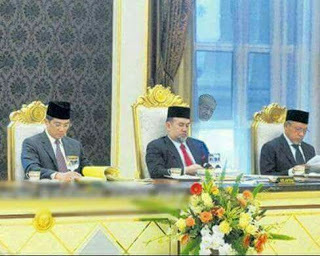 But, seriously, you think the Palace is controlled by Najib and his koncos? Of course not. Not even during Mahathir's era, when the Judiciary was (supposedly) under his control. The Council of Rulers is its own institution. To say that it is owned by Najib and the BN government is to be disrespectful of the Raja-Raja. Contemptuous, even. Now, who could be that disrespectful and contemptuous of the Raja-Raja? "Now, who could be that disrespectful and contemptuous of the Raja-Raja? Go figure." Ohhhh, thank you for the question. a) Who disregarded the Rulers' instruction to get to the bottom of 1MDB? The Chief Thief seems to think that his botched cover-up is a response? Don't think so. b) Who disregarded the Rulers' instruction to amend the NSC? Oh yes, it was the Chief Thief again. What a shame that most of the illiterate hacks on the right sidebar of your blog need this stolen cash to survive, eh Latuk? Yes, they won't complain if the Chief Thief steals even more money. It all goes around. This is the first time we see your naivety. Why invite him then disinvite? Obviously you know the answer, so tell us! If you don't, then stop saying Najib does not control the Istana because you pun tak tahu if it's not true! You going for the kill on Mahathir lately ya? No more beating around the bush when bashing Mahathir ya? Your paymaster must have upped the allowance for you up your attack. However, we expect it already cos once a dedak eater will always be a dedak eater. What do we expect from a has been reporter with a delusion of grandeur? You should to Gulag for bike your rally once UMNO bungkus after PRU 14. That way no need to come back. To maintain the datukship is not cheap. So, who cares!